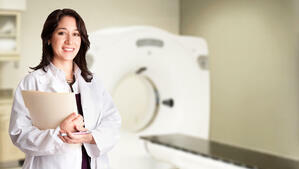 Ordering providers must consult Appropriate Use Criteria (AUC) using a qualified Clinical Decision Support (CDS) system when ordering advanced imaging examinations such as MR, CT, PET and other nuclear medicine exams for Medicare patients. The list of specific procedure codes that will require AUC consultation is contained in the Medicare publication MLN Matters (MM10481). The burden of reporting the AUC consultation to Medicare is on the radiologist, and when the penalty phase begins the radiologist’s payment will be denied in full when the ordering provider fails to use the system. The denial of payment will apply to both the professional and technical components of the Medicare reimbursement, whether the procedure is billed separately or globally. Inpatient services covered under Medicare Part A are not subject to the regulation. Services performed at a Critical Access Hospital (CAH) are not subject to the regulation. Services ordered for an individual with an emergency medical condition do not require a consultation, regardless of the location where those services are performed. Electronic health records (EHR) or qualified clinical decision support mechanism (qCDSM) vendor issues. For example, issues might include technical problems, installation or upgrades that temporarily impede access to qCDSMs, a vendor ceases operations or a qCDSM becomes de-qualified. Extreme or uncontrollable circumstances (including natural or man-made disasters). The AUC consultation must take place using a qualified Clinical Decision Support Mechanism (qCDSM). A CDSM is defined as, “an interactive, electronic tool for use by clinicians that communicates AUC information to the user and assists them in making the most appropriate treatment decision for a patient’s specific clinical condition.” The CDSM tool can be either an integral part of an existing electronic health records system or a stand-alone system, as long as it is certified by CMS as a qualified system. The initial list of fully-qualified CDSMs was published by CMS early in 2017, and another list contained those with preliminary qualification. CMS has posted the list of qualified CDSMs on its website. Practices designing and implementing their systems will want to be sure the qCDSM they have chosen becomes fully qualified by January 1, 2020.
which qualified CDSM was consulted by the ordering professional. the NPI of the ordering professional who consulted the AUC (if different from the furnishing professional). Note that the ordering professional’s clinical staff may perform the AUC consultation when delegated to do so under the direction of the ordering professional. The exact mechanism for reporting is not yet defined but it is expected that there will be a series of G-codes and modifiers. The 2018 MPFS indicated that a unique AUC identifier system will most likely be developed to allow CMS and the qCDSMs to share data. During the current voluntary reporting period that ends December 31, 2019, modifier QQ (Ordering Professional Consulted A Qualified Clinical Decision Support Mechanism For This Service And The Related Data Was Provided To The Furnishing Professional) may be reported on the same claim line as the applicable procedure code. The reporting of this modifier is totally optional, and its use or non-use will have no effect on the radiologist’s reimbursement. CDS is not brand new, and your hospital might already have a system in place. This will certainly make adherence to the Medicare requirement much easier! Within the hospital system the CDS will most likely integrate into the EMR system to transmit the results of the AUC consultation. Since hospital technical component payments will also depend on compliance with the rule, hospitals that do not already have CDS will be gearing up to develop and mandate the use of AUC/CDS systems along with radiologists. Working together with the hospital on the system development is the best way to assure the radiologists that the system will be in place in time, and also that it will integrate with their own billing system or RCM vendor to obtain the AUC consultation data to use for Medicare billing. In the private practice office or imaging center, the practice will have to investigate a CDS that will integrate with their Radiology Information System (RIS). The obvious place to begin is with the current RIS vendor. If the RIS vendor is not offering a CDS module, then a stand-alone system will have to be considered. Either way, the practice’s CDS will likely take the form of a portal for referring physicians to use, much like they access the practice’s PACS. The earlier your practice implements its CDS portal, the longer you will have to introduce it to referring physicians and get them used to accessing it. Since there will be no financial penalty to the ordering physician who does not consult and document the use of AUC, there is little incentive for them to use the CDS. However, ordering physicians might benefit under the Quality Payment Program (QPP) since AUC consultation is included as a high-weighted activity in the “Patient Safety and Practice Assessment” subcategory of Improvement Activities. Radiology groups in private office or imaging center sites should consider conducting an education program for referring providers and their support staff who will be able to perform AUC consults under the physician’s direction. The program will point out the QPP benefits of using CDS, and then train the ordering professionals on the use of the portal and the specifics of the CDS interface. The practice’s marketing team will then have to be diligent with a follow-up program to be sure ordering physicians understand the use of the practice’s portal and are using it regularly. Regardless of the site of practice, radiologists will have to be sure their revenue cycle management (RCM) vendor is ready to accept the AUC information from either the hospital or private practice’s qCDSM. Meet with your RCM vendor early to understand the steps they are taking to be ready to submit your data to Medicare. While the requirement to submit AUC consultation information does not begin until January 1, 2020, the sooner radiologists and their hospitals implement an appropriate AUC/CDS system the greater the compliance level of the ordering physician community will be when the time comes for payment denials. Radiologists might consider whether they will refuse Medicare referrals that are not accompanied by a qualified AUC consultation and begin to develop a policy around such occurrences. Healthcare Administrative Partners will continue to monitor and report any changes to the timeline or requirements of this Medicare rule that could have a significant negative impact on radiology practices if they do not comply fully. Subscribe to our blog, which is updated regularly with information practices need to maximize reimbursement.